Last week the New York Times reported the latest innovation from employers who use the H-2B visa temporary foreign worker program to hire workers to staff traveling carnivals (think your local county or state fair): an employer-created union that collectively bargains with employers on behalf of workers to keep wages artificially low. Thanks to a loophole in H-2B wage regulations, low-wage, low-road employers are permitted to pay their temporary foreign workers dreadfully low wages. For about half a decade, thanks to an H-2B wage regulation the George W. Bush administration illegally put in place in 2008, employers of landscapers, dishwashers, tree planters, maids, janitors, carnival workers, and construction workers were allowed to pay their H-2B employees as little as the local 17th percentile wage. (This is legally defined as the “Level 1” prevailing wage, based on Labor Department wage survey data for the job and local area.) After the rule was struck down in federal court in 2010, the Obama administration promulgated a final wage rule in 2011 that would have required employers to pay H-2B workers the local average wage (what’s also known as the Level 3 prevailing wage). However, this effort led to years of federal litigation brought by H-2B employers that stopped the rule in its tracks, and spurred an onslaught of corporate lobbying that convinced members of Congress from both major parties to deny funding to the Labor Department to enforce the rule. Finally, in April 2013, the wage rule for the H-2B program was re-promulgated as an interim final rule issued jointly by the departments of Labor and Homeland Security. (The fact that the rule was issued jointly negated the main legal challenge, namely that the Labor Department lacked authority to promulgate any H-2B wage regulation.) The 2008 and 2013 H-2B wage rules both required employers to pay their H-2B employees the wage set out in an applicable collective bargaining agreement (CBA). But under the 2008 rule, if no CBA applied, then employers were allowed to pay the 17th percentile wage. The 2011 final H-2B wage rule that Congress blocked would have required employers to pay the higher wage between the CBA wage or the local average wage. Under the 2013 rule, if no CBA covered the H-2B worker, then the employer would have to pay the local average wage. Will Republicans Cut Budgets for Worker Safety, Pension Protection, and Wage and Hour Enforcement? The White House sent a Labor Day message from Director of the Office of Management and Budget Shaun Donovan about the many important issues affecting working Americans that will be decided in the next month of congressional budget negotiations. The message is well worth reading. Donovan describes what he calls a “double-pronged attack on the workers we are celebrating today.” This attack includes deep cuts at the Wage and Hour Division, which protects workers against wage theft by crooked employers, and which collected $250 million in back pay for workers last year. Republicans also want limits on the use of third-party experts to accompany OSHA compliance officers on workplace safety inspections, where they can point out hazards OSHA might miss. They want to cut the budget and limit enforcement of the National Labor Relations Board’s rules to protect workers who join together for better working conditions. They want to block a new OSHA rule that will save thousands of workers from death, disabling lung disease, or cancer from inhaling silica dust. And they are trying to kill a new effort by the Department of Labor to protect retirees from financial advisors who put their own interests ahead of their clients’ interests. None of the laws protecting working Americans from wage theft, on-the-job injury, unlawful retaliation, or self-dealing by financial advisors is meaningful if the government doesn’t enforce them. That takes resources and staff—investigators and lawyers who can take on big corporations or reckless businesses. Yet congressional Republicans want to cut funding for enforcement of all these laws. At OSHA, for example, Republicans want a 10 percent cut—$57 million, even though OSHA’s inspectors already can’t get to even one percent of workplaces in a year, and negligent employers put workers in harm’s way every day and kill nearly 100 employees a week. This post originally appeared on SCOTUSblog, as part of a symposium on Fisher v. University of Texas at Austin, the challenge to the university’s use of affirmative action in its undergraduate admissions process. The “diversity” standard in college admissions has gained great popularity because advocates of race-based affirmative action, stymied by the Court since Regents of the University of California v. Bakke, latched onto it as an alternative that could satisfy strict scrutiny. Many proponents have since persuaded themselves that diversity is, after all, a better approach than race-based affirmative action and that if the Court had not required it, we would have had to invent it. Yet while diversity in college classes is certainly an important educational and social goal, its elevation nonetheless dodges the nation’s racial legacy and avoids our constitutional and moral obligation to remedy the effects of centuries of slavery and legally sanctioned segregation. Without acknowledging we were doing so, we have engaged in a legal sleight of hand, substituting enriching the educational experience for remedying past injustice in designing affirmative action policy. Underlying all this has been the Court majority’s conviction, most recently in Fisher I, that university officials have not identified specific Fourteenth Amendment violations for which their policies are a remedy, and therefore their consideration of race injects, without constitutional justification, a discriminatory racial consideration into the admissions process. The paucity of African Americans at the University of Texas reflects no de jure exclusion, the Fisher I majority believed, but only de factosocial inequality for which there is no race-conscious constitutional remedy. Therefore, including racial diversity in a scheme of skill-based, interest-based, or economic diversity is suspect, requiring very strict scrutiny. Indeed, the conditions set by the Fisher I majority opinion suggest a scrutiny that is strict in theory but fatal in fact. (I discuss the Fisher cases here only as they relate to the treatment of African Americans in affirmative action plans, not to that of other national or ethnic minorities or of disadvantaged economic groups; each has a different history and status, requires different opportunities to succeed, and raises different social policy and constitutional concerns). As students head back to school this fall, today’s release of the August jobs numbers provides the first complete look at the summer job market for teens. As a whole, the stronger start to the 2015 summer jobs season (compared to last summer) signaled by the June youth employment numbers was sustained throughout the summer. According to seasonally unadjusted teen employment-to-population (EPOP) ratios, averaged for the months of June, July and August, African American youth experienced the largest boost to summer employment compared to last year. 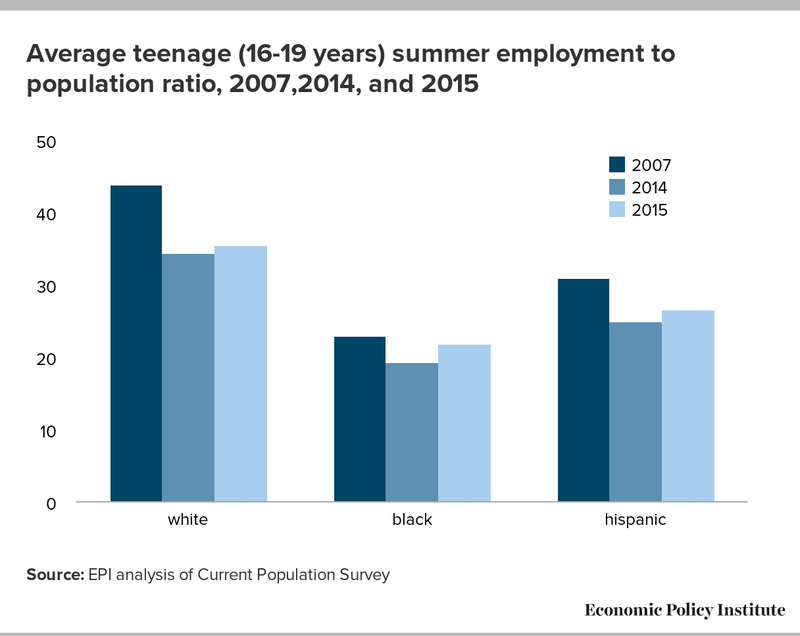 Summer employment was up 2.5 percentage points for black teens, compared to a 1.5 percentage point increase for Hispanic youth and a 1.2 percentage point increase for white teens, as shown in the figure below. Though black teens continue to have the lowest rates of employment, the 2015 summer youth employment rate for black teens was closer to its 2007 pre-Great Recession rate than were those of white and Hispanic youth. The official unemployment rate (the U3) is only one data point—one that doesn’t include workers who have left the labor force because of weak opportunities or workers who want to be working full-time but can only get part-time work. The fact is that the economy is still not adding jobs fast enough, and the recovery is not creating strong wage growth. The best advice is for the Federal Reserve to continue doing what they’re rightfully doing—keeping rates low to let the economy recovery. Many pundits have been quick to encourage the Federal Reserve to raise rates, but a close look at the data shows that the economy still needs time to grow. Nonfarm payroll employment rose by only 173,000 in August. While it’s best not to read too much into one month’s data, this brings average monthly job growth down to 212,000 so far in 2015. 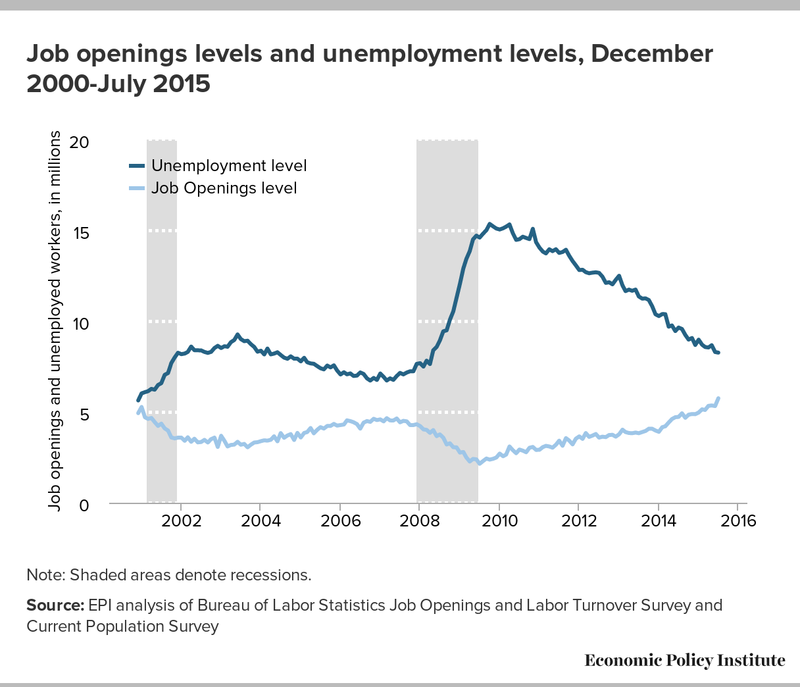 2014 saw faster jobs growth: an average of 260,000. By that measure alone, we aren’t seeing an accelerating recovery. In fact, at this slower rate of growth, a full jobs recovery is still two years away. A great example of just how slow this job recovery is going is the flat prime-age employment-to-population ratio (EPOP). This means the economy is only adding enough jobs to keep up with prime-age population growth—nothing more, nothing less. It means the economy is moving at a pace where we are not working off any of the joblessness that remains from the Great Recession. The prime-age EPOP in August (77.2 percent) is still below the lowest trough of the last two recessions (78.1 percent). We have a long way to go before this data point says recovery. At the beginning of August, Netflix announced that it would grant its employees “unlimited” parental leave during the first year after a child’s birth or adoption. After the initial praise, though, a darker side of the announcement was revealed: only “salaried streaming employees”—the roughly 2,000 white-collar workers who work in the company’s streaming division—will be covered by the new policy. Employees of Netflix’s DVD distribution centers, meanwhile, will not receive the benefit of paid parental leave. A few have asked whether or not Netflix’s paid parental leave policy will set a new standard in the American workplace. Unfortunately, the exclusion of its lower-paid workers from the policy already reflects a harsh reality facing U.S. workers: paid family leave is a rarity, and when it is offered, the recipients are much more likely to be high-wage earners. As the figure above shows, only 12 percent of private sector workers in the United States receive paid family leave, a number that puts us behind our international peers. (Among the 34 OECD nations, for example, the United States is the only nation that does not mandate paid maternity leave.) Which workers receive paid family leave is heavily determined by how much they earn—just like Netflix’s policy. 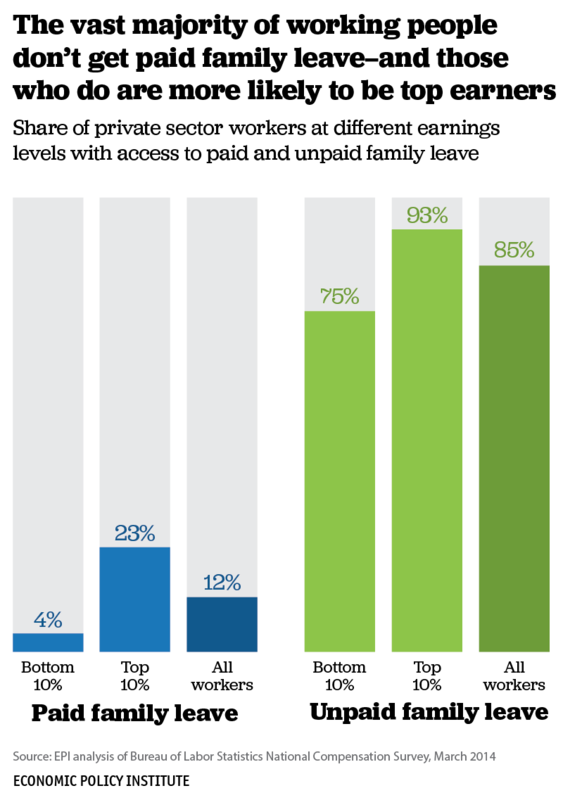 While 23 percent of workers at the top of the wage distribution have access to paid family leave, only 4 percent of workers at the bottom receive the benefit. This month, the Federal Open Market Committee (FOMC) will meet to decide whether to raise interest rates in order to slow down the economy and ward off incipient inflation, and I know I sound like a broken record, but, the stakes are too high not to keep repeating the same message over and over again. So let me say it again: the economy doesn’t need to cool off. It needs to simmer a while longer. Unfortunately, a serious look at the economy suggests slow growth, and not a hint of acceleration—making a rate hike terribly premature. 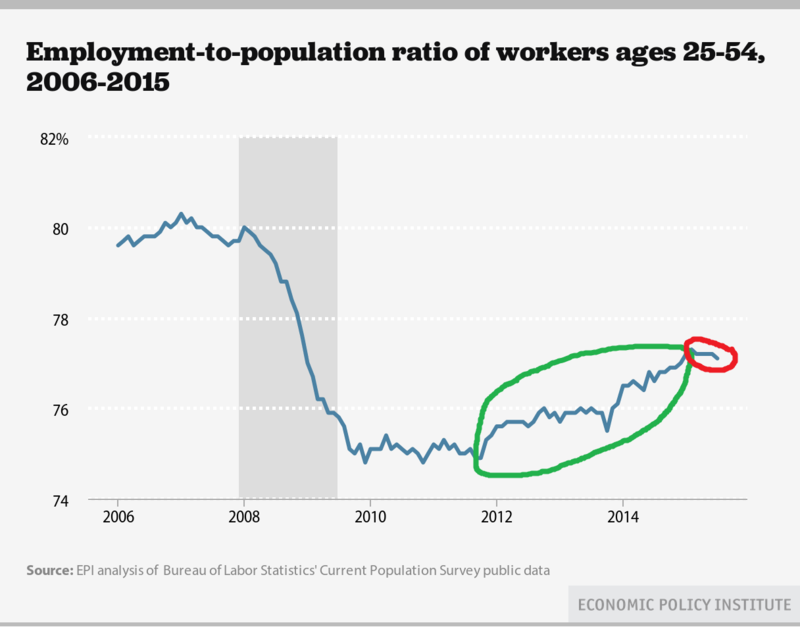 In light of the upcoming Federal Reserve decision, the two measures I’ll be closely watching on Friday, when the Bureau of Labor Statistics releases its monthly jobs report, are nominal hourly wage growth and the prime-age employment-to-population ratio (EPOP). Nominal wage growth is one of the top indicators the Fed should watch as it considers whether or not to raise rates, and I don’t see much positive news there. Wage growth has been pretty flat for the last five years, as shown in the chart below. Lately, it’s been teetering in the 1.8 to 2.2 percent range. By any standard, that’s anemic. And there has certainly not been any sign of acceleration in these data. My name is Caleb Sneeringer, and I worked for Walgreens for six years. I was first hired in 2008 as an assistant manager, and in 2010 I was promoted to executive assistant manager—my first salaried position with Walgreens. I earned a salary of $46,000 and was scheduled for 45 hours a week. Unfortunately, 45 hours a week quickly turned into 55–70 hours. You see, around the time of my promotion, Walgreens implemented a “no overtime” rule for hourly employees. In my store this and other budget cuts resulted in a loss of approximately 150 hours a week among hourly employees—and their work and responsibilities were shifted to salaried staff. This created a more unpredictable scheduling situation, and many store associates were forced to use SNAP assistance (i.e., food stamps) to meet their basic needs. Right now, the U.S. Department of Labor is considering an important rule change that would affect salaried workers and overtime pay. If implemented, the overtime salary threshold will be raised from $23,660 to $50,440. For me, my former coworkers at Walgreens, and millions of workers across the country, this rule change will mean the right to receive the overtime pay we are owed. After the Department of Labor (DOL) issued regulations last year requiring third-party providers of home care services to pay the minimum wage and overtime to their employees, various employer groups filed suit in federal court in an attempt to have the new rules struck down. In short, they argued that the Secretary of Labor didn’t have the legal authority under the Fair Labor Standards Act (FLSA) to change the definition of “companionship services” it had used in the regulations it promulgated in 1975 to set wage and hour rules for home care workers. The U.S. District Court judge who heard the case, Richard Leon, didn’t just agree with the employers, he wrote a vituperative opinion expressing his outrage that the Department of Labor was arrogantly usurping congressional powers. This blog post originally appeared on Wall Street Journal Think Tank. Recent volatility in stock markets in the U.S. and globally has led many economic observers to conclude that the Federal Reserve is less likely to begin raising short-term interest rates at its September meetings. I’ve been on Team Don’t Raise for a while now, but I’m not excited about those joining the cause in light of recent stock market swings. As a general principle, the Fed should not react to short-term movements in the financial markets. For one thing, the labor market is much more important to the lives of most Americans, and it is more relevant to the Fed’s mandate of securing maximum employment with inflation stability. Then consider this: More than 80% of stock wealth in the U.S. is owned by the wealthiest 10% of Americans, and more than half of Americans own no stocks at all (either directly or through retirement or other accounts). In short, movements in the stock markets do not have much effect on the spending power of most U.S. households. That means that movements in the stock markets—especially short-term volatility that is likely to largely dissipate—provides little information about the overall state of economic health. President Obama recently announced a major overhaul of the rules governing the payment of overtime to salaried employees. These changes are long overdue and will finally align the overtime exemption for salaried employees with common sense and the original intention of the law—to ensure that all workers receive overtime protection except those with such high salaries or such substantial responsibilities that they don’t need the protections. Since the president’s announcement, opponents of the proposal have made a number of questionable claims. One claim in particular—that nonprofit organizations providing services to the poor and the disadvantaged will see a crippling increase in personnel costs—is demonstrably false. The Fair Labor Standards Act (FLSA) is based on a few basic principles. First, most employees in the United States are entitled to the minimum wage, currently set at $7.25 per hour at the federal level, for all hours worked, and “time-and-a-half” for all hours worked over 40 in a workweek. These rules, first enacted in 1938, have proven to be a simple but important protection for workers and the labor market, guaranteeing workers at least a minimal level of wage protection. The second principle, however, is that FLSA coverage does not extend to all employees or all employers. There are number of exemptions and exclusions from minimum wage and/or overtime embedded in the FLSA. Unless coverage is established for the employer or employees, the protections of the FLSA, including the proposed overtime rule changes, simply do not apply. Catherine Rampell wrote a piece having some fun with the bidding war among GOP candidates about how much they can promise to raise economic growth rates. There’s some good stuff there—including the riff on how GOP politicians are looking to “disrupt” economic statistics largely by defunding those doing the valuable work of collecting them. One hears variants of this argument a lot*, but it’s actually really hard to make an economic case that this dynamic—increased U.S. competitiveness stemming from war destruction in our trading partners—mattered at all for mid-century American growth. Is the claim that exports surged and that’s why mid-century growth was good? They really did not—exports grew substantially faster post-1979 than before. And we were not shielded from import growth in the pre-1979 period, since imports grew faster than in the pre-1979 period than after. The Times was so impressed with such enlightened views from this prominent capitalist that a few days later they devoted another long article with his answers to questions submitted by readers. We should, I suppose, be grateful that Georgescu seems to understand that the gap between the rising value of what American workers produce and the stagnation of their wages has channeled the benefits of economic growth to shareholders (and, he might have added, but didn’t, corporate CEOs). But if you are waiting for him and other members of his class to get serious about the problem, don’t hold your breath. Georgescu writes that he would like to see corporations pay their workers a fair wage. But with few exceptions, they don’t. He doesn’t tell us why, but the reason is obvious—paying workers less has made their owners and top executives rich. In the Washington Post Fact Checker column today, Glenn Kessler got really exercised about Bernie Sanders’ totally accurate description of a Congressional Budget Office (CBO) report on job losses that will occur if spending caps in the Budget Control Act (BCA) are not loosened in coming years. In the end, Kessler’s “fact check” is much more misleading than anything Sanders and his staff released. The CBO provided a range of estimates of job losses that would occur in 2016 and 2017 if these spending caps are not lifted (alternatively, one could describe these as job gains that would be realized if the caps are lifted). The high end of these estimates was 800,000 jobs in 2016 and 600,000 in 2017. That’s how much higher total employment in the United States could be if the caps were lifted, relative to a counterfactual baseline where the caps stay in place. First of all, note that the Sanders’ statement says that “as many as” 1.4 million jobs would be lost. That’s a signal that a politician is using the high-end of a range. I was caught off guard by all of the recent attention and coverage given to Senator and presidential candidate Bernie Sanders’ positions on immigration. Not because his views were widely discussed (he is running for president, after all), but because the criticisms he was subjected to were often mistaken or even intentionally misleading. So what did Senator Sanders actually say about immigration? In an interview with Sanders, Vox.com editor Ezra Klein brought up the concept of an “open borders” immigration policy. Sanders rejected the notion—open borders and unlimited immigration, of course, being a position that no elected official supports. Sanders went on to point out—a point which he later reiterated to journalist Jose Antonio Vargas and the Hispanic Chamber of Commerce—that in some cases the importation of new foreign workers can negatively impact the wages of workers in the United States. Note that Sanders didn’t say immigrants are taking jobs or lowering wages. He was specifically referring to non-immigrant, temporary foreign worker programs, also known as “guestworker” programs, which are full of flaws that employers take advantage of to exploit American and migrant workers alike, and to pit them against each other in the labor market. The reality is that what Sanders supports on immigration is careful and nuanced, and it’s the correct path forward for American immigration policy. In a nutshell, Sanders is strongly in favor of legalization and citizenship for the current unauthorized immigrant population, which will raise wages and lift labor standards for all workers, and he’s against expanding U.S. temporary foreign worker programs, which allow employers to exploit and underpay so-called guestworkers. Limiting guestworker programs will reduce wage suppression and improve labor standards for U.S. and migrant workers alike. Arguably, the most important measure for the Federal Reserve as they decide whether to raise rates in September is nominal average hourly earnings. Over the year, average hourly earnings rose only 2.1 percent, in line with the same slow growth we’ve seen for the last six years. And wages for production/nonsupervisory workers rose even more slowly, at 1.8 percent over the year. The annual growth rates are slow by any measure, but are certainly far below any reasonable wage target. Wage growth needs to be stronger—and consistently strong for a solid spell—before we can call this a healthy economy. As shown below, nominal wage growth since the recovery officially began in mid-2009 has been low and flat. This isn’t surprising—the weak labor market of the last seven years has put enormous downward pressure on wages. Employers don’t have to offer big wage increases to get and keep the workers they need. 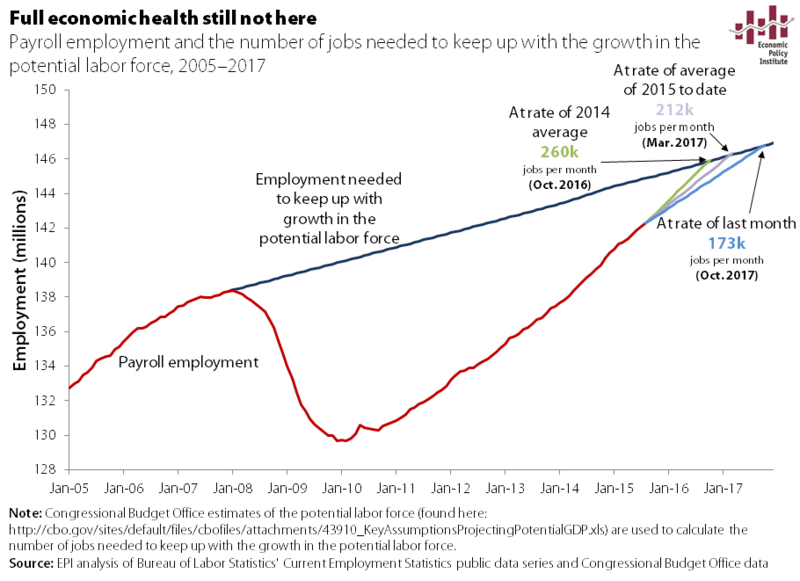 And this remains true even as a jobs recovery has consistently forged ahead in recent years. Pressure is building on the Fed to reverse its monetary stimulus by raising short-term interest rates, slowing the recovery in the name of stopping wage-fueled inflation. Fortunately, the Fed has said that their decision to raise rates will be “data driven.” The data clearly show that the economy has not improved enough. 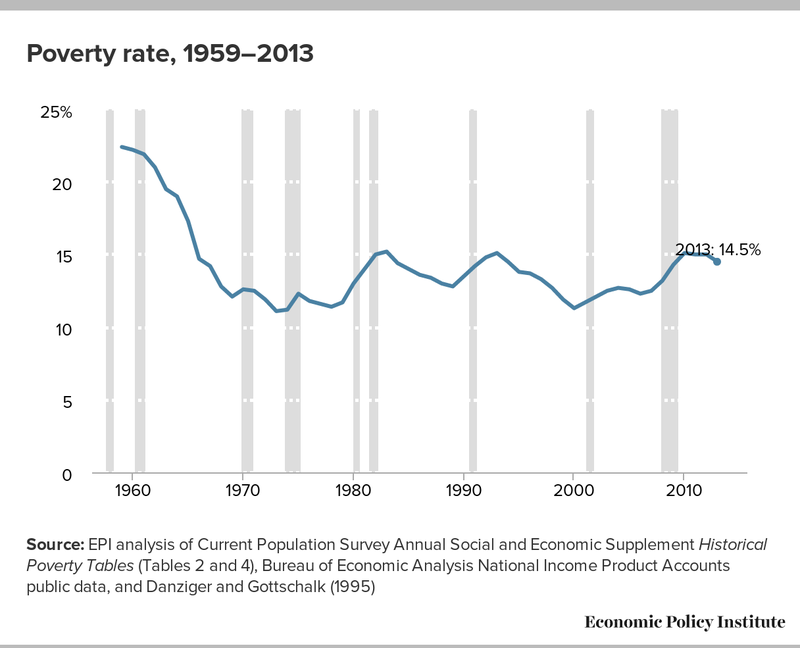 The most obvious point is the huge nose dive prime-age EPOP took during the Great Recession. The green circle shows the slow climb as the recovery began to take hold. 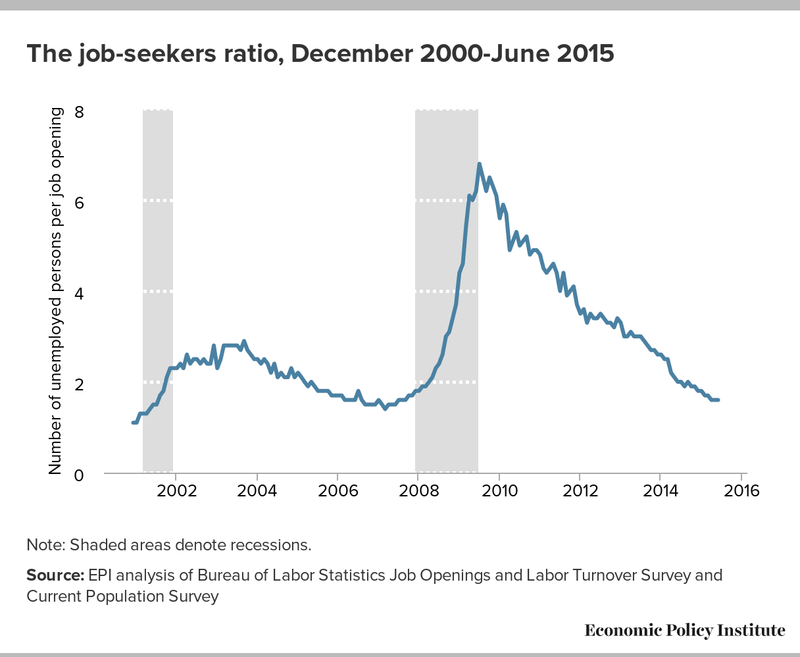 We had a couple years of solid job growth, and that’s a fairly decent pace for the EPOP recovery. Then, early this year, the EPOP stalled out (see the red circled region). The prime-age EPOP hit 77.3 percent in February, then stagnated for four months at 77.2 percent, and fell slightly to 77.1 in July. This would be a terrible new normal for the economy, for the American people. The White House is reportedly considering an executive order that would require that federal contractors provide their employees with seven days of paid sick leave. This is a step in the right direction: The United States remains alone among our economic peers worldwide in failing to give all workers access to earned paid sick time. Through this executive order, President Obama can lead by example, and start to shift the paradigm towards giving more American workers and their families the right to take paid leave to care for their own or their family members’ health needs. Currently paid sick days laws are or will soon be in place in 24 jurisdictions across the country, including four states: Connecticut, California, Massachusetts, and Oregon. The evidence from these jurisdictions has been overwhelmingly positive. The first jurisdiction to set a paid sick days standard was San Francisco, where employers have been required to offer earned paid leave since 2007. Fears that the law would impede job growth were never realized. In fact, during the five years following its implementation, employment in San Francisco grew twice as fast as in neighboring counties that had no sick leave policy. According to the Institute for Women’s Policy Research, San Francisco’s job growth was even faster in the foodservice and hospitality sector, which is dominated by small businesses and viewed as vulnerable to additional costs. Connecticut, meanwhile, became the first state to enact a sick-days standard in 2011. A year-and-a-half after the law took effect, researchers at the Center for Economic and Policy Research found that the law brought sick leave to a large number of workers, particularly part-time workers, at little to no cost to business. By mid-2013, more than three-quarters of employers expressed support for the law. The federal minimum wage has languished at $7.25 since 2009. As inflation erodes the real value of the federal minimum, twenty nine states (and D.C.) have taken it upon themselves to raise their state minimum wages. Some states have made small changes (such as Arkansas, which raised its minimum wage to $7.50), while others have moved forward more boldly (such as Massachusetts, where the state minimum wage will reach $11.00 by 2017.) Some passed incremental increases which will take place over two or three years, while others have automatic increases every year to account for inflation. Several enacted changes to their laws back in 2006, while others have jumped on the new wave of action that has taken place in the past few years. There is tremendous variation in minimum wage policy across the states, and EPI’s minimum wage tracker provides a simple and intuitive way to understand the breadth of state, local, and federal minimum wage policy. Five states do not have a minimum wage. Alabama, Louisiana, Mississippi, South Carolina, and Tennessee all defer to the federal minimum wage of $7.25 in the absence of any state laws. Wyoming and Georgia both have a state minimum wage lower than the federal minimum. The minimum wage in both of these states is $5.15, but the federal minimum wage applies. Tomorrow, when the Bureau of Labor Statistics releases its monthly jobs report, we’ll be looking at what the Federal Reserve should pay attention to as they debate whether or not to raise interest rates at the next FOMC meeting in September. The Fed has continued to read the signs right and has kept its foot off the brakes as the economy continues to recover from the Great Recession. However, there are some rumblings of an interest rate hike in September. Such a hike would be premature. Where’s the evidence that the Fed should raise rates this year? If anything, the recovery has been slowing: on average, only 208,000 jobs were added in the first six months of this year, compared to an average 281,000 in the last six months of 2014. Yes, there was a long, cold winter, but we’ve yet to see the thaw in the topline numbers. A serious look at the economy suggests slow growth, not acceleration. Nominal wage growth is one of the top indicators for the Fed to watch as it considers whether or not to raise rates, and I don’t see much positive news there. Wage growth has been pretty flat for the last five years, as shown in the chart below. And, the data from the Employment Cost Index that came out earlier this week confirms those trends. Recently, everyone from Hillary Clinton to the American Enterprise Institute (AEI) has been focused on the “gig” economy—businesses like Uber and Taskrabbit that let consumers call up services on demand with their computers or phones. Despite all the attention these businesses have received, both AEI and the Wall Street Journal have pointed out that the gig economy supposedly has not shown up in Bureau of Labor Statistics job data. But while the on-demand economy has not appeared in government labor statistics—yet—that does not mean that it is not having an impact on people’s livelihoods. The rise of the gig economy is part of a wider trend that Yale political scientist Jacob Hacker has noted of risk being shifted from employers onto the backs of workers. New technologies have only accelerated this shift. Drivers for Uber and Lyft, as well as most workers in the gig economy, are classified as independent contractors, despite the fact that their employers direct much of their work activities. Uber, for example, tells drivers where to pick up passengers and also deactivates drivers’ accounts if they consistently receive poor ratings from passengers. But because they are independent contractors, drivers are responsible for insuring their own vehicles, and the company does not provide them with health insurance, paid vacation, or retirement benefits. Independent contractors are also unable to file for unemployment compensation, must bear all of the cost of Social Security payroll taxes, and cannot file for workers’ compensation. Ride-sharing is not the only part of the economy where workers are frequently misclassified as independent contractors, however. Misclassification happens throughout the economy, everywhere from construction to housecleaning to home health care. Across the board, this practice leads to lower wages and tax revenues, among other social costs.